One of the world's most identifiable brands has continued to evolve throughout its history. 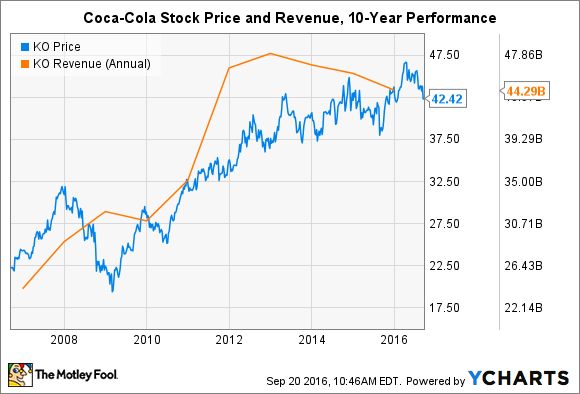 Carbonated soft drink sales may have fallen for 11 straight years, but The Coca-Cola Company (NYSE:KO) has plenty to offer investors. The blue chip stock boasts a dividend yielding 3.3%, has achieved at least $10 billion in sales for 23 consecutive quarters, and has managed to outpace headwinds within its industry by investing in growth brands. Far from a stale legacy brand, the company is focused on continuously improving operational efficiency and being at the forefront of consumer trends. The result: a tremendous amount of shareholder value has been created in the last 10 years. Coca-Cola stock has returned 144% during that period including dividends, compared to a 93% run for the S&P 500 using the same metric. The company grew full-year revenue 92% from the end of 2005 to the close of last year, while dividend payouts per share have increased 135% in that span. Simply put, it's been a great decade for investors. While the numbers are great, looking back at the ways Coca-Cola has changed in the last 10 years -- and the events that enabled such spectacular growth -- could help to shed light on where the company is headed in the next decade. The $182 billion company has a dizzying number of moving parts, but several transformative events took place in the last decade that shaped the brand into what it resembles today. In 2006, after reeling in complaints from independent bottlers, Coca-Cola established the Bottling Investments Group to preside over all company-owned bottling operations. The near-term goal was to create a new standard for quality, address concerns about a lack of transparency and standards, and ensure investments continued to be made in bottling infrastructure. In the longer term, management planned to resell the bottling assets to independent operators. Today, the Bottling Investments Group oversees 25% of total volume for the company -- making it the largest single bottler. Coca-Cola is also making good on its promise to refranchise its bottling assets. As of this summer, management had reached agreements to refranchise 65% of American bottler distribution volume and 43 of 51 cold-fill production facilities. The efforts -- integral to ensuring quality control and efficient, low-cost operations -- will be completed by the end of 2017. Another hallmark of Coca-Cola is its willingness to acquire growth brands. That included Energy Brands (vitaminwater and smartwater) in 2007, ZICO (coconut water) in 2013, and a minority stake in Suja Life (cold-pressed juices) in 2015 -- all of which are non-alcoholic ready-to-drink (NARTD) beverages. Of course, investments in non-traditional brands should be expected when carbonated soft drink sales are in a perpetual free fall. The good news is that the moves have worked out brilliantly. The second quarter of 2016 marked the 25th consecutive quarter in which Coca-Cola gained value share in NARTD beverages. Perhaps more importantly, the investments have continued to open new markets. Coca-Cola Beverages Africa -- created from merging certain non-alcoholic beverage assets of SABMiller, GFI, and the namesake company -- began operations in July 2016. The new venture will account for 40% of volume on the continent, which is home to some of the brand's highest growth markets. In additional to growing sales in Africa and NARTD brands globally, Coca-Cola is investing heavily in reviving the future prospects of carbonated soft drinks. While sales of fizzy, sugary drinks have fallen in each of the last 11 years; investors shouldn't write off the flagship beverage just yet. It is true that consumers are making more health conscious choices -- rightfully so, given the devastating effects of a diet high in added sugar -- but the future of carbonated soft drinks may not contain sugar at all. Despite a past littered with failed and troubled diet brands and artificial sweeteners, the entire industry has high hopes for plant-based, zero-calorie sweeteners in the stevia family. In fact, more than 45 different Coca-Cola brands replace a portion of their sugar content with stevia ingredients. First-generation stevia ingredients left a lot to be desired, but next-generation ingredients nearing commercialization, coupled with new product formulations, make it possible to replace 100% of the sugar content of a carbonated soft drink without sacrificing taste. While the industry needs to navigate a few obstacles in communicating the change to consumers before stevia dreams come true, it could be just the innovation needed to revamp soda sales -- albeit healthier soda. Today, over 1.7 billion products under the Coca-Cola brand are consumed every day, which works out to about 19,400 products every second. The company has reached that level of market share by focusing on continuous operating improvements and being first in line to capitalize on -- or even catalyze -- new consumer trends. There may be headwinds present today in the industry, but if Coca-Cola has proven anything in the last 10 years, it's that the blue chip brand is more than capable of changing to meet market demands.